Los Angeles. Breed Street Shul. Facade detail. Photo: Samuel Gruber 2018. Until recently, it had been over a decade since I last visited the Breed Street Shul in Los Angeles' Boyle Heights district, once home to LA's bustling East European Jewish immigrant community. Today the area is mostly Hispanic but a few Jewish traces and landmarks remain. The Breed Street Shul is the most prominent of these. Local preservationists and community activists have been slowly restoring the massive building which was close to collapse two decades ago. In 2005 I wrote about the effort in the Forward as it was just getting started The roof and windows had been repaired and the structure had been made dry and safe(er), though more structural work and the upgrading of all mechanical systems was needed, as well the complete rehabilitation of the adjacent space. 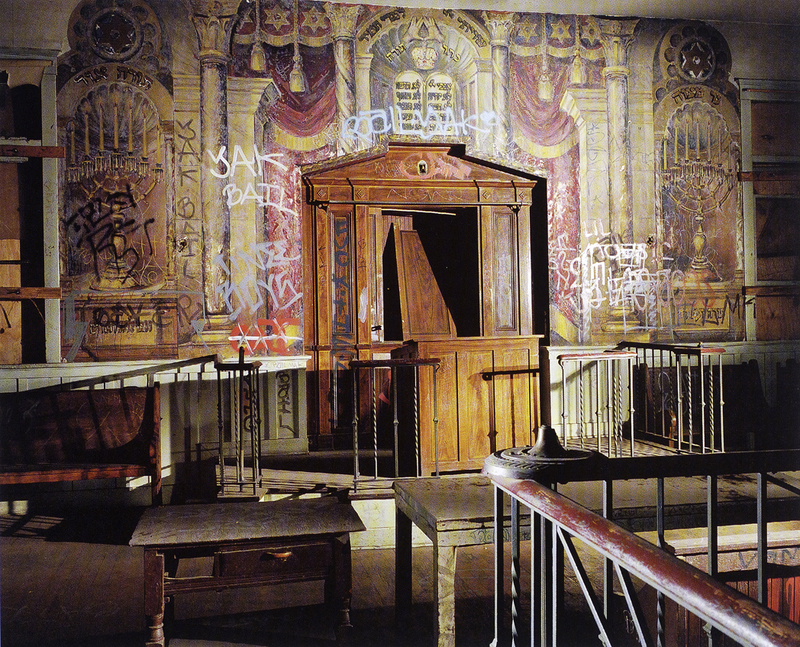 These included a heavily damaged and graffiti-covered Beth Midrash, with a large desecrated mural behind the Ark. Stopping in for a brief visit more than a decade later some things had changed a lot; others not so much. The sanctuary is still a "large, empty hall, with a few benches, a battered bimah, and traces of wall paintings with the tree of life and signs of the Jewish calendar still visible" It still calls to mind many ruined or empty synagogue buildings I have visited over a 30-year period in Central and Eastern Europe. At Breed Street much of the destruction and loss of the building’s fixtures and decoration took place in a short time after 1996. 1986 photos on display by Bill Aron show the sanctuary and Beth Midrash as fully functional. The Breed Street Shul, formally known as Congregation Talmud Torah, opened its sanctuary 1923, following designs by the architectural firm of Edelman and Barnett. In the heyday of the synagogue, 75,000 Jews lived in Boyle Heights and nearby City Terrace, and the Breed Street Sanctuary could accommodate about 1,100 of them. The synagogue’s architect, Abram Edelman (1864-1941), was the son of the first ordained rabbi to serve in Los Angeles. He was a prominent architect in Southern California for several decades and later in the 1920s he would help design Wilshire Boulevard Temple, thus having a hand in creating both the Orthodox and Reform centers of Southern California Judaism. Leo Barnett, his partner at Breed Street, was also his nephew. On this visit I paid much more attention to the wall paintings than I has before. In the sanctuary are painted large rectangular panels of mazoles or Zodiac signs of the months of the Hebrew calendar. These are on the parapet wall of the women's gallery and on panels dividing the big sanctuary windows on the south and north walls, and on the east wall flanking the ark. 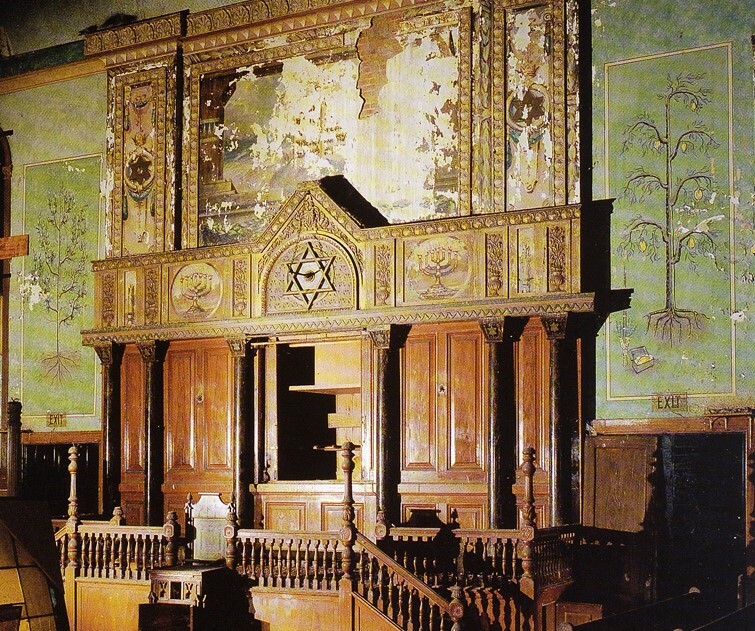 Overall, synagogue wall paintings have received short shrift from historians, and consequently we have lost many with little or no documentation. 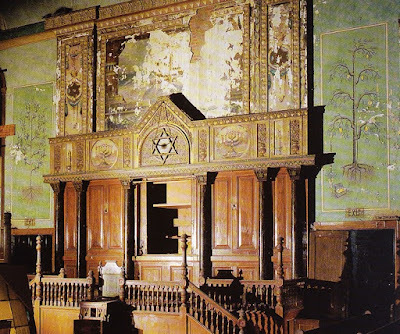 The penchant for decorating synagogue with sighs of the Zodiac representing the Jewish months, and hence the calendar and all cosmic time, was brought by immigrants from Europe, where Zodiac signs had been included in different media in Jewish art for centuries, including synagogue murals. There were many examples of this type of painting in New York, and a few examples survive. The mazoles murals at the Breed Street Shul are charming, lively, and markedly different from similar signs found in synagogues in the East. They are also quite different from paintings on the sanctuary ark wall, which are described below. Presumably the mazoles were painted around the time the synagogue was built (mid 1920s)- though they do have a 1950s looks to them and it is not impossible that they were added later. At this time we do not know who the artist was, but he (it was almost certainly a man) was clearly someone trained with a modern sensibility, and perhaps with experience in animation or commercial art. 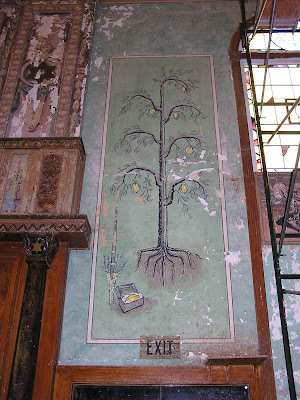 In addition to the mazoles, the Breed Street sanctuary is adorned with other painting on the ark wall. In the far left corner are paintings of instruments, probably referring to the 150th psalm. Two unusual paintings of trees flank the Ark. Each shows it roots, but the one on the north (left) has leaves but no fruit. The one to the south (right) of the Ark is meant to be an etrog tree - the fruits are clearly visible on the spindly branches. As if there is any doubt, at the bottom is an etrog box and lulav, the traditional signs of the holiday of Sukkot. Given this clear meaning, the first tree is probably meant to be a myrtle (הֲדַס / hadas), the aromatic evergreen that grows wild in Israel, and is traditionally considered the "boughs of leafy trees" referred to in Leviticus 23:40. It is one of the "four species" needed to celebrate Sukkot, along with the willow, lulav and etrog. There was once a large painting in the center of the Ark but this is so damaged it is difficult to identity. But it once represented a large Decalogue (Ten Commandments) sitting atop a mountain, with an expansive landscape around it. This presentation of the Law on Sinai is a known theme in synagogue art. Los Angeles, CA. Ark painting before damage. The greatest improvement at Breed Street is the repair of ancillary spaces and the complete renovation of the former Beth Midrash into an exhibition and meeting space. There is an informative exhibition on the history of the Boyle Heights neighborhood installed in the space. But the high point is the preservation of the original Ark and its conservation. When I saw it in 2006 the pace was trashed and the mural was covered with graffiti. Now he large spoil painting has been fully cleaned and conserved. The painting style is in the tradition of theatrical backdrops, and perhaps a painter of film sets of the silent era was engaged for the work (as Hugo Ballin was at the Wilshire Boulevard Temple at about the same timer). 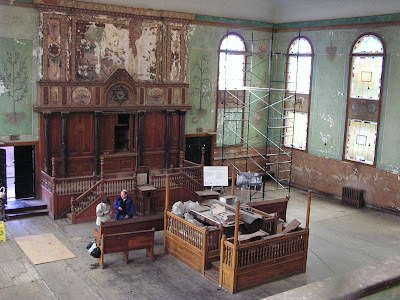 Although there is probably no direct connection, the closest American synagogue example to this mostly architectural composition is the rescued mural form the former Chai Adam Shul in Burlington, Vermont. 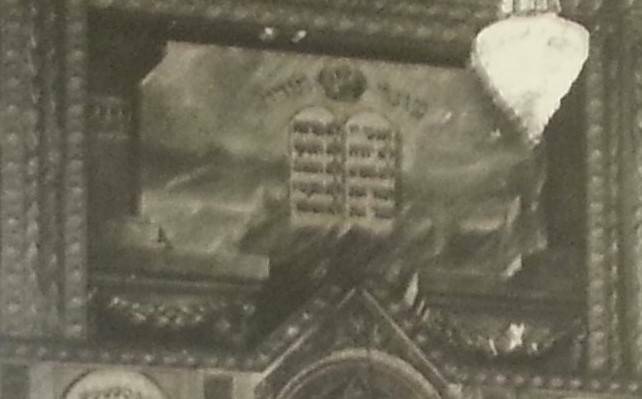 Like Burlington, the Breed Street Beth Midrash ark includes four columns, hanging curtains, and a Decalogue. Here there are also menorahs, Jewish stars and the priestly blessing. We'll keep watching progress at Breed Street. It is a generational project. Total costs are in the millions, but without a Jewish use there doesn't seem to be a donor - Jewish or otherwise - in the offing. More than $50 million was spent to restore the contemporary Wilshire Boulevard Temple, but that is still serves as the center of a large and active congregation. The Breed Street Shul deserves a future ...who knows exactly what it will be? 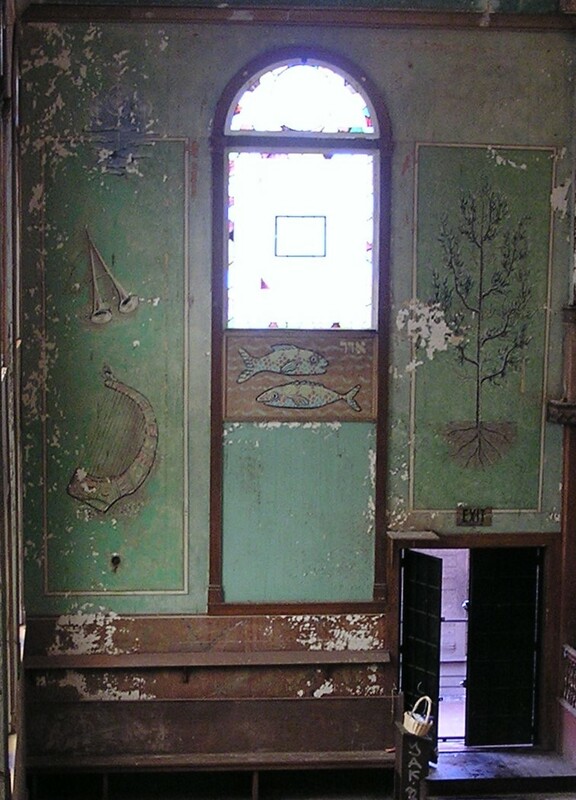 Whatever the future, I hope that the wall decorations, as modest as they are, are part of the plan. Sam, it may be worth flipping through the remake of The Jazz Singer, filmed at Breed St., for images. Does Bill have any others in his files? Bill Kramer’s archives are at UCLA, and I noted once stuff there. Also, Last I heard the dayghter of the last rabbi lives in Eftat. It was destroyed shortly after her mom died, if I am not mistaken.